Scott had energy this morning. And you know what that means, people. Road Trip! 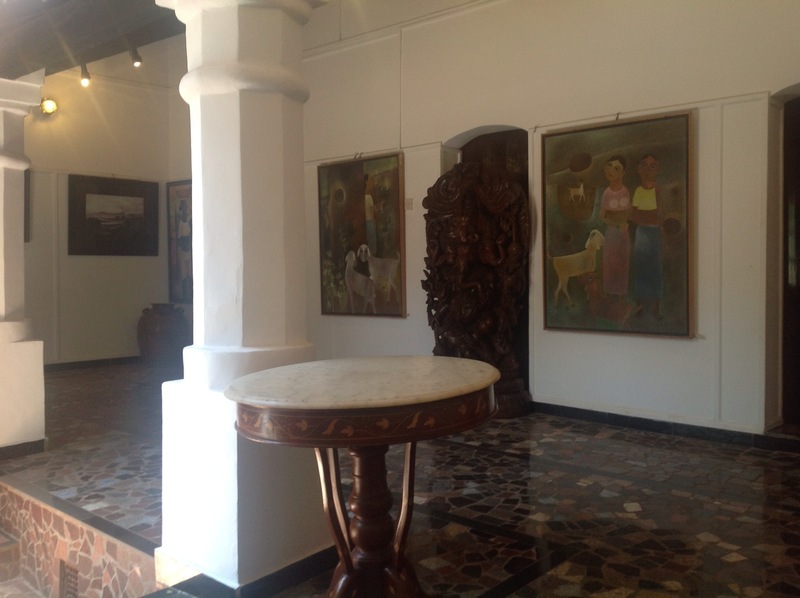 When we found out we’d missed the movie we were aiming for, we came up with another plan: gallery hopping in Goa. 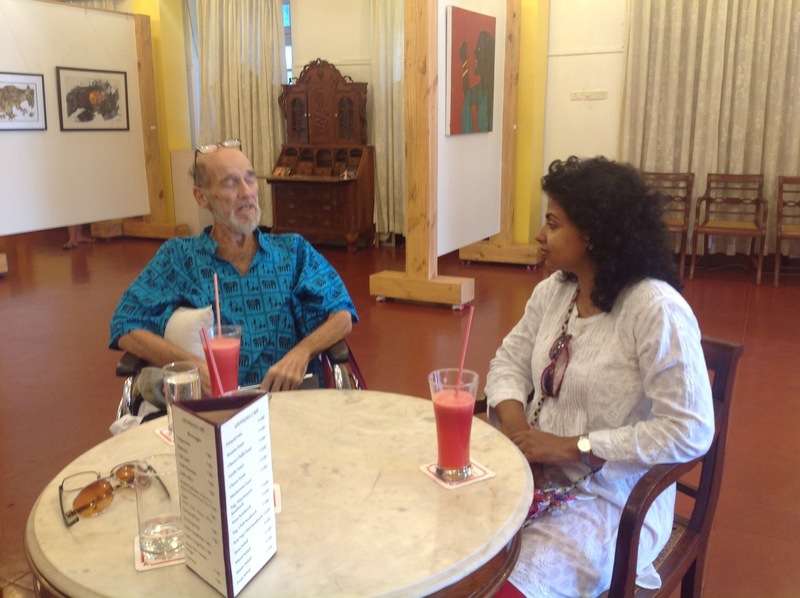 In Panjim’s old Latin Quarter known as the Fountainhas district there is a a trio of charming World Heritage inns that are also home to Miriam Koshy-Sukhija’s Gallery Gitanjali. The high ceilinged airy historic Portuguese buildings are the perfect foil for Miriam’s artists to show their work. I went to an art opening at Gitanjali last Friday night for Vamona Navelcar and requested he sign the Clown Series IV line drawing that our friend Abu gave me during his visit. This morning Scott and I went back together to explore and see more of his work and the rest of the complex. 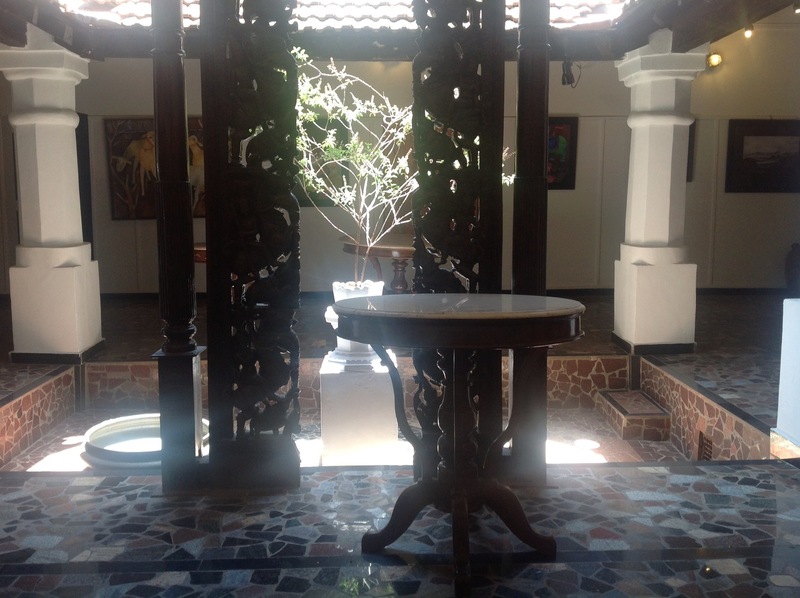 We were delighted that Miriam was able to show us around at the main gallery as well as the atrium gallery in the Poussada Inn. That’s Miriam chatting with Scott in the photo above. There is a lovely petit cafe menu and we sampled delicious fresh watermelon juice while savoring the art exhibit. 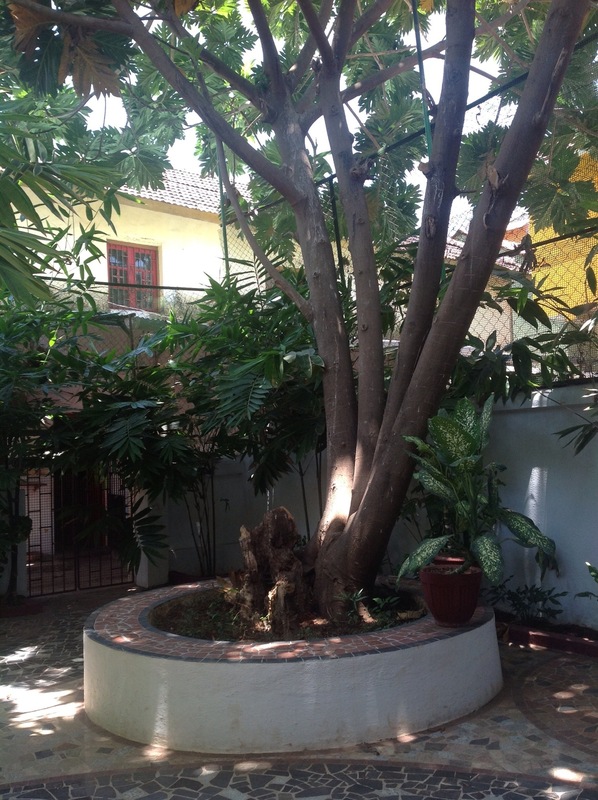 The secret walled garden at the Poussada Inn had a marvelous antique swing and lush shade trees. A perfect retreat from the hub-bub of the city. 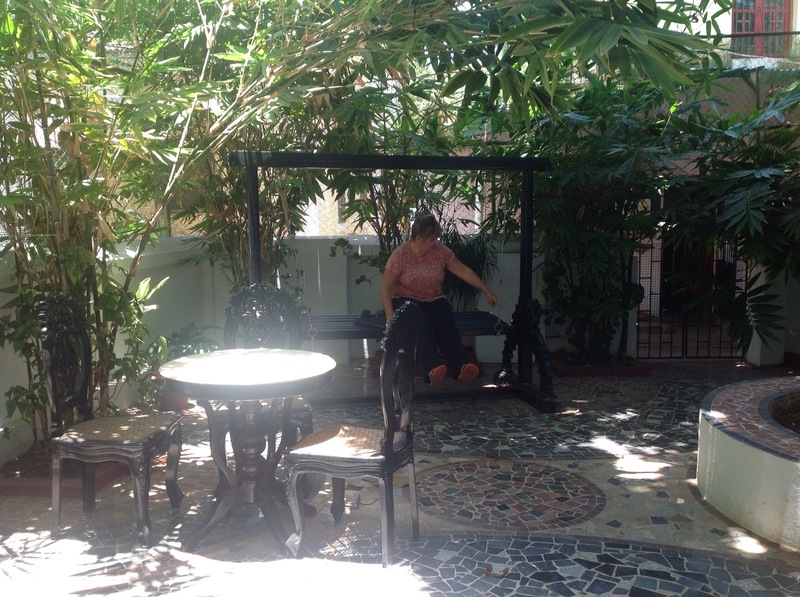 We peeked through a door to see antique Portuguese four poster beds and interesting tile work. 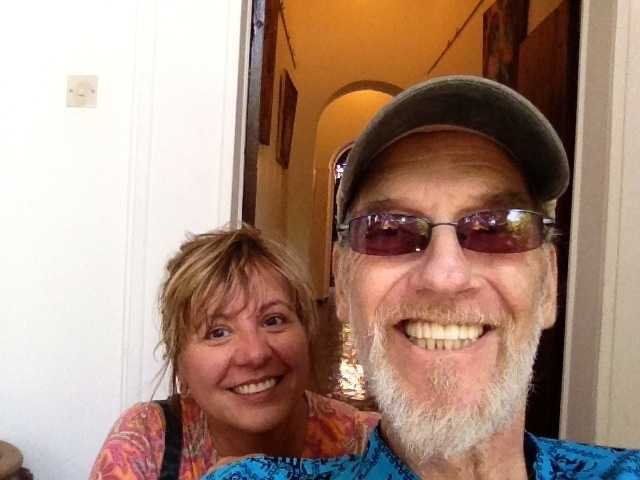 When we discovered Miriam will be going on a trip to DC and NYC soon to see some art, Scott offered to put together a list of must-see museums and galleries tailored to her interests. This is a free service that all of Scott’s friends and family take advantage of as he is a walking Fodor’s Guide to all the best places. We’re happy to add Gallery Gitanjali and the three heritage inns to our short list of Panjim’s best places to see while visiting Goa. The relentless sun finally caught up with us after a couple of hours having fun so we asked the taxi driver to pull over to a Baskin Robbins for some refreshment. There was a nearby KFC and we indulged in that, too, although we never eat it back home. Ensconced in our digs back at the hotel Scott experienced some tummy trouble. Scott is not one to bellyache (even when he has one). Instead, he toughed it out seated in his wheelchair for awhile. The day's pleasure is not over yet. 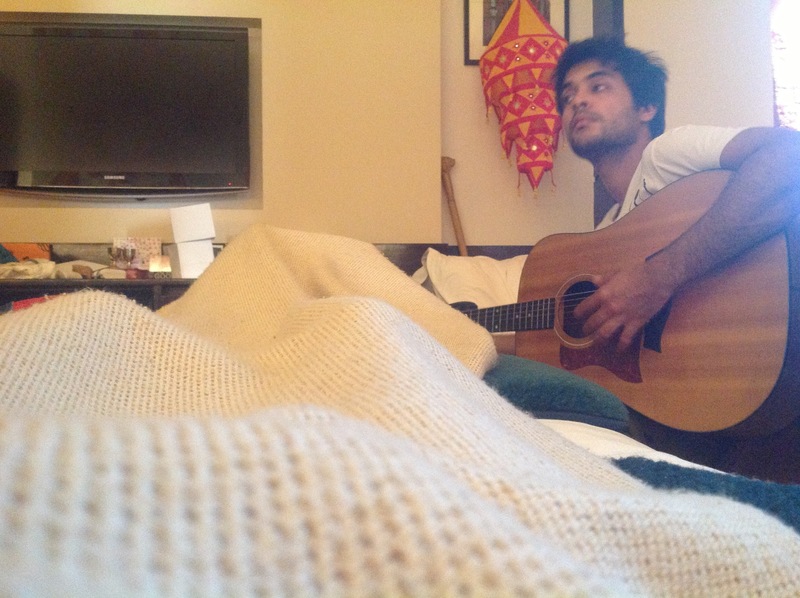 Right now he is laying in bed enjoying some live guitar music provided by our friend Arjun Verman who stopped by for an impromptu visit this afternoon with his cousin Karrin. You can see and hear Arjun playing if you watch our commitment ceremony. What a treat to hear Arjun’s sweet voice and mellow guitar wafting over the sounds of the everpresent surf. This entry was posted in Uncategorized and tagged arjun verman, art, artists, galleries in goa, gallery gitanjali, Going to Goa Blog, Katy Allgeyer, Scott Morgan, the panjim inn, the poussada inn, travel, traveling with cancer, vamona navalcar, world heritage inns. Bookmark the permalink. Just saw your Dad and Lindy as well as Paulette. The one we want to see most is YOU! But you are in our hearts as well as our minds. Setting up on Thursday just did not seem the same without your visit, your kibitzing, etc. You are missed!